Incredibly durable, lightweight, weatherproof and waterproof, the Nomad Camo Series is constructed with carbon fiber/fiberglass composite material in an Orvis-exclusive camo fish pattern. Nomad Nets are built for the conditions that prevail where great fishing exists; they are UV protected, and float like a cork. Rubberized RiverKoat coating offers positive grip in wet conditions. The Hand Net is perfect for use with a vest or small pack, the Mid-Length is specifically designed for backpack anglers, and the Guide Net is superb for boats or wading guides. All Nomad Nets come standard with a rubber bag. In gray camo. Imported. Hand Net is 25½"L, weighs .63 lbs. head is 8½"W x 17"L, bag depth is 11". 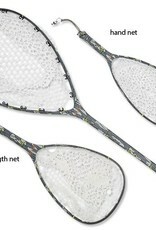 Mid-Length Net is 37"L, weighs .88 lbs., head is 13"W x 18"L, bag depth is 12". 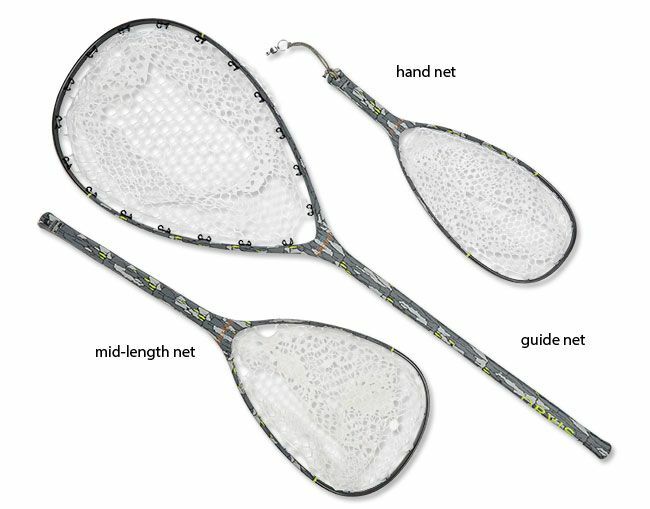 Guide Net is 55"L, weighs 1.6 lbs., head is 16"W x 24¾"L, bag depth is 14".